Will wearing red on Fridays show support for U.S. troops overseas? Claim: Wearing red on Fridays will demonstrate support for troops overseas. You will soon see a lot of people wearing RED on Fridays. Here’s why….. The Americans who support our troops, are the silent majority. We are not “organized” to reflect who we are, or to reflect what our opinions are. Many Americans, like yourself, would like to start a grassroots movement using the membership of the Special Operations Association, and Special Forces Associations, and all their friends, simply to recognize that Americans support our troops. We need to inform the local VFW’s and American Legion, our local press, local TV, and continue carrying the message to the national levels as we start to get this going. Our idea of showing our solidarity and support for our troops is starting Friday, and continuing on each and every Friday, until this is over, that every RED – blooded American who supports our young men and women, WEAR SOMETHING RED. If every one of our memberships share this with other acquaintances, fellow workers, friends, and neighbors, I guarantee that it will not be long before the USA will be covered in RED – and make our troops know there are many people thinking of their well-being. You will feel better all day Friday when you wear RED! Wear RED on Fridays . SUPPORT OUR TROOPS! WE LIVE IN THE LAND OF THE FREE, BECAUSE OF THE BRAVE. FOR US, THEIR BLOOD RUNS RED!! GOD BLESS AMERICA. in the suggested activity, it’s real — demonstrations need not be “officially” organized or sanctioned to be symbolic and meaningful. support for U.S. troops by sending them supplies, books, or even encouraging messages. We hope that some of our readers might look into these programs as well. 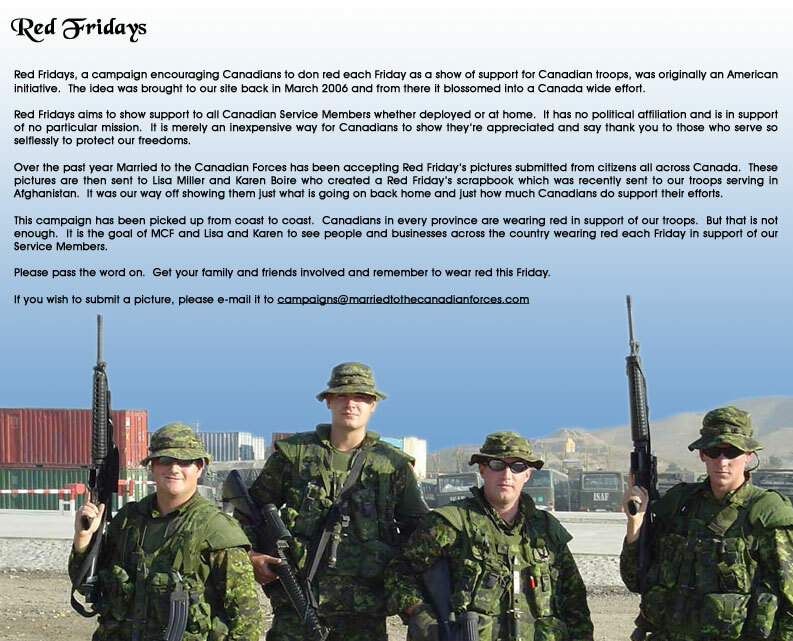 In the spring of 2006, a “wear red on Fridays to show support for the troops” crusade began developing in Canada after Lisa Miller and Karen Boire, the wives of two Canadian servicemen, thought to adapt the 2005 American exhortation quoted above to Canadians serving overseas and post the revamped suggestion to their web site, MarriedToTheCanadianForces.com. Their “Red Fridays” movement has been widely publicized and has proved to be very popular among military and non-military families alike. On 23 September 2006, thousands clad in red attended such a rally led by Canadian Prime Minister Stephen Harper on Parliament Hill. Red, by the way, is a color very strongly associated with all things Canadian, which possibly accounts for part of the reason for the program’s being embraced so enthusiastically by the U.S.’s northern neighbor. While some choose to interpret the solidarity display as being intended for Canada’s military efforts in Afghanistan, others regard it as meant for Canadian soldiers abroad no matter how they got there and what they’re doing and to offer them a visible “Thank you” for putting themselves on the line. Ottawa Citizen. 23 September 2006 (p. A5). Pembroke Observer. 4 May 2006 (p. 1).